Posted on Wed, Mar 14, 2012 : 11:30 a.m.
A pedestrian crosses at Seventh and Washington on Wednesday. In the background, a pedestrian-activated and solar-powered flashing beacon now alerts drivers to stop, but this particular pedestrian didn't activate it. 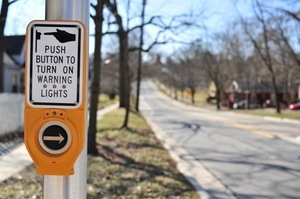 The first of Ann Arbor's new pedestrian-activated crosswalk beacons is helping Slauson Middle School students and neighbors more safely cross Seventh Street at Washington. Additional crosswalk beacons are expected to become operational later this month at four locations along Plymouth Road, city officials said. A closer look at the flashing beacon. This pedestrian also didn't use it. 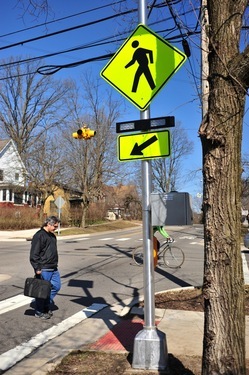 The Ann Arbor City Council approved the purchase of the Rectangular Rapid Flashing Beacons at a meeting back in December following controversy over the city's pedestrian safety ordinance and several rear-end accidents at crosswalks along Plymouth Road. Ann Arbor resident Roger Shambaugh was one of the first to test out the new beacons during an afternoon jog on Wednesday with his dog Riley. Even with the lights flashing, he still stopped and waved a car or two through before proceeding carefully across Seventh Street. "People should yield to pedestrians," he said. "But you still have to remember it's the laws of physics, so whether they're going to follow it or not, you have to assume they won't." AnnArbor.com observed during a half-hour period many pedestrians aren't yet aware they can push a button to activate the beacons. Most crossed without activating the signal. The four crosswalks expected to get RRFBs along Plymouth Road are located near Beal Avenue, Bishop Avenue, Traver Village and Georgetown Boulevard. When activated by a pedestrian, the crossing sign displays a flashing beacon, indicating that someone is waiting to cross or is currently walking across the street. This signal alerts drivers to stop behind the painted stop bar in the road until the pedestrian has safely crossed the street or reached a refuge island. Pedestrians must confirm oncoming vehicles have stopped before stepping into the road. 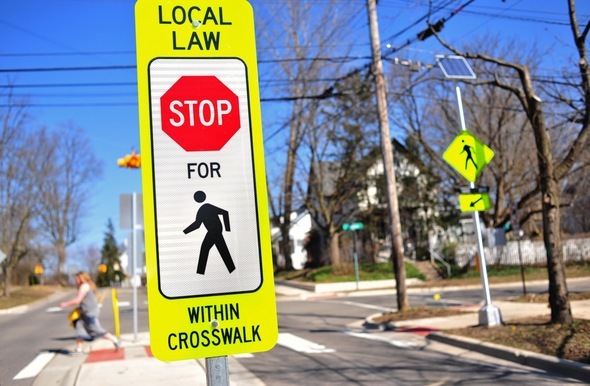 According to state law, motorists can't pass vehicles stopped at a crosswalk. Shambaugh said even with signs warning motorists to stop for pedestrians, Seventh Street has been difficult to cross during peak traffic hours. He hopes the new lights help, and he thinks they'll be especially useful at night because they'll give motorists a visual warning to stop beyond "just some guy on the side of the road." He said he'd like to see the flashing beacons installed in more parts of the city, including at Liberty Street and Virginia Avenue. This is the button to push to activate the new signal. "The one on Liberty and Virginia, they need flashers there," he said. "Especially in the morning walking to school, crossing Liberty from the Eberwhite neighborhood." The new beacons include a rectangular light bar attached to a standard pedestrian crossing sign, providing enhanced communication between pedestrians and drivers at busier crosswalks where there is not already a traffic signal. City officials say ensuring pedestrian safety is especially important in Ann Arbor, where 17.7 percent of residents walk to work, nearly six times the national average. Ann Arbor has been named a gold-level walk friendly community by the Pedestrian and Bicycle Information Center. The city also was recognized by Prevention magazine and the American Podiatric Medical Association as the third most walkable city in the country. 10:148.Pedestrians crossing streets (a) When traffic-control signals are not in place or are not in operation, the driver of a vehicle shall stop before entering a crosswalk and yield the right-of-way to any pedestrian stopped at the curb, curb line or ramp leading to a crosswalk and to every pedestrian within a crosswalk when the pedestrian is on the half of the roadway on which the vehicle is traveling or when the pedestrian is approaching so closely from the opposite half of the roadway as to be in danger. (b) A pedestrian shall not suddenly leave a curb or other place of safety and walk or run into a path of a vehicle that is so close that it is impossible or unsafe for the driver to yield. (c) Every pedestrian crossing a roadway at any point other than within a marked crosswalk or within an unmarked crosswalk at an intersection shall yield the right-of-way to all vehicles upon the roadway. Uniform Traffic Code for Cities, Townships and Villages R 28.1703 Rule 703 (1) When any vehicle is stopped at a marked crosswalk or at any unmarked crosswalk at an intersection to permit a pedestrian to cross the roadway, the driver of any other vehicle approaching from the rear shall not overtake and pass the stopped vehicle. Additional information on the city’s new crosswalk beacons is posted online at www.a2gov.org/WalkBikeDrive. Fri, Aug 17, 2012 : 12:43 a.m.
State law is pretty clear for red stop lights. put one at every dangerous crosswalk activated by the pedestrian. if council realty wants to be impressive why not a law that just says &quot;hit a pedestrian, go to jail - 1 to 5 years&quot; and post a sign at each entry into town. Thu, Mar 15, 2012 : 7:38 p.m. I wonder if this will help prevent drivers from routinely flattening the sign in the crosswalk's median when they hurriedly turn left onto southbound 7th from westbound Washington. Anyone know how many times this has happened? It is my imagination, or is Ann Arbor City Code 10:148 the most unnecessarily long and confusing regulation ever written, to govern something so simple as walking across a street? Thu, Mar 15, 2012 : 1:24 a.m.
Why pay the extra money for solar panels when electricity is right there? Thu, Mar 15, 2012 : 1:26 a.m.
And to boot, the sign/panel in the picture is partially in the shade when the leaves return. Brilliant! Thu, Mar 15, 2012 : 12:58 a.m.
Now its time to work on the rest of 7th St. There are ZERO crosswalks from Pauline to Liberty...with multiple neighborhoods, schools, and churches along that stretch. And the traffic is way too fast! Wed, Mar 14, 2012 : 11:05 p.m.
gosh this is great now we just need to remind people to cross at them not the middle of the street!!! Wed, Mar 14, 2012 : 11:10 p.m. This will help, now that it will be safe to bother to do so. Wed, Mar 14, 2012 : 10:53 p.m.
Why push the button if you're not going to cross!!!!!!! Wed, Mar 14, 2012 : 10:28 p.m.
@motorcycleminer Had a bad day, eh? Sure, this stuff can get annoying, especially while they're trying to work out the bugs, but that is one BLIND crossing, with people zipping around the corner off of eastbound Huron -- which maintains an average speed of about 42, 44 mph -- with no appreciable slowdown. And right around that corner, just a few feet away, is a little girl walking to school, carrying a cello bigger than she is. Yeah, she could stand there on that island -- getting there from the east was easier, since you can see south on 7th -- she could stand there all she wants and &quot;STOP ,LOOK and LISTEN&quot; -- at least until rush hour is over, and there is a gap in the traffic. It's a fact of life that speed limits, traffic signals, and, although I hate to say it, traffic circles, are necessary, and do save lives. Wed, Mar 14, 2012 : 9:36 p.m. Wed, Mar 14, 2012 : 9:29 p.m.
My recollection tells me this is kind of a blind intersection if you're coming from the north and a slight curve as well. Further it's only about 200 yards from Huron where people fly. LOOK FOR TROUBLE HERE. Wed, Mar 14, 2012 : 9:25 p.m. I don't know how well this will work. I do, however, question the location of the initial installation. Plymouth Road e.g. has much more dangerous crosswalks as do many other areas of the city. Perhaps it has to with ward and respective council persons good relationships to Mayor Hieftje? I believe this crosswalk is in Mr. Hohnke's ward? A little good publicity goes a long way in an election year, doesn't it? Wed, Mar 14, 2012 : 9:09 p.m. Wed, Mar 14, 2012 : 7:41 p.m.
With all the money spent on this anti-logic experiment, why not just install pedestrian bridges? Also who's genius idea was it to put bus stops at these cross walks on Plymouth road? I have seen multiple people stopping for people waiting for the bus. Wed, Mar 14, 2012 : 7:28 p.m.
UPDATE: City Council has passed a law making it illegal for a pedestrian to not push the button. Signs will be installed saying &quot;Push Me&quot; and bells will ring while a treat (donated by local businesses) will fall from a dispenser. Wed, Mar 14, 2012 : 7:47 p.m. Wed, Mar 14, 2012 : 7:37 p.m.
LOL. I don't know if anybody's heard the annoying sound these things make, but if I lived at one of the corner houses there, you can bet those things would get destroyed just about nightly. Wed, Mar 14, 2012 : 7:15 p.m. I agree that some sort of signal is a good idea for the schoolkids crossing 7th, and also Liberty. People still don't know how to use the one on Huron, though -- I came up to it three times yesterday while drivers waited for it to go through its entire cycle before moving. Solid red means stop, and stay stopped -- just like any other solid red light. And likewise, when the light starts flashing, it is no different from any other flashing red light -- stop, then proceed when traffic is clear. A lot of people waste a lot of time -- both their own and that of others -- when they sit there without thinking. Wed, Mar 14, 2012 : 7:09 p.m.
it is a start in the right direction. lets see what happens and will it work. lets hope so. no light is stupid. Wed, Mar 14, 2012 : 6:44 p.m.
&quot;Ann Arbor resident Roger Shambaugh was one of the first to test out the new beacons during an afternoon jog on Wednesday with his dog Riley. Even with the lights flashing, he still stopped and waved a car or two through before proceeding carefully across Seventh Street.&quot; Great. So the pedestrians can let us drivers off the hook with the old &quot;Shambaugh Wave-Off&quot;. Thats good to know. Christ sakes alive. The laws funky enough as it is without the pedestrians arbitrarily controlling traffic with hand signals. Just stand there. Let the cars stop...or not, and proceed when it is safe to cross. Ya know. Like we were all taught when we were 3? Wed, Mar 14, 2012 : 10:52 p.m.
What do you consider a long time? 30 seconds. I cross the street at this cross walk twice a day. I usually don't even need to break stride to cross safely. I wonder how those middle schoolers have done it so long without the flashing lights. Wed, Mar 14, 2012 : 9:38 p.m. Wed, Mar 14, 2012 : 4:51 p.m. Wed, Mar 14, 2012 : 4:55 p.m.
OK, maybe I was a bit harsh. But details are lacking in the article, which seems a bit much a &quot;feel good&quot; piece. Wed, Mar 14, 2012 : 4:37 p.m. I like these signaled crosswalks. Even in the day time, pedestrians can be difficult to see. I was driving on Plymouth just yesterday and the pedestrian waiting to cross the street was standing behind a sign. I was able to see him in time to stop for him but had it been night time, I wouldn't have seen him. However, that changes once a flashing light is added to the equation. Thank you Ann Arbor for spending a little money to solve the problem. Wed, Mar 14, 2012 : 5:19 p.m. The same thing happened to me yesterday also on Plymouth. Eastbound there is a light pole that obscures pedestrians from oncoming traffic at one of the crosswalks. I was so thankful that the guy didn't trust me to see him and remained on the curb. Technically, I broke the law. Technically, he had the right of way. Can I just say that I hate the new pedestrian law! When I lived in Charlottesville, VA, the city installed similar crosswalk lights in the roads, angled such that drivers approaching from either direction would see the flashing lights from far off. The ones being installed here sound like a similarly great idea. I liked them both as a driver and a pedestrian. Cars were more likely to stop in general, and did so from a safer distance rather than suddenly stopping when seeing a pedestrian at the last second. Pedestrians felt much safer and were not forced to stand dangerously close to oncoming traffic just to get them to stop. I'm sure there are many more places these can benefit Ann Arbor. Thu, Mar 15, 2012 : 11:53 a.m. Wed, Mar 14, 2012 : 4:15 p.m. Considering the drivers on Huron were ignoring the HAWK today I don't hold out much hope. Wed, Mar 14, 2012 : 7:27 p.m.
Not this time. I was waiting to turn left on to Huron and the pedestrian had the walk signal and two cars proceded through before she could cross. Basically cut the pedestrian off. Wed, Mar 14, 2012 : 4:26 p.m. Wed, Mar 14, 2012 : 4:04 p.m.
Good place to put one of these. At night, and especially if it's raining, visibility at this intersection is terrible.